If you’re keeping up with the current WWE product, you’ll know that Shawn Michaels is about to lace up his boots once again, beginning with D-Generation X reuniting to face The Brothers of Destruction at Crown Jewel. Whether this is a one-off appearance or the first of another run for The Showstopper (surely Mr. WrestleMania will grace the grandest stage of them all at least once more? ), interest in Michaels is at a high level right now, making it a very appropriate time for WWE to release a brand new DVD on HBK. Anyway, it’s impossible not to get excited about a Michaels collection, given that he is one of the greatest in-ring performers of all-time. We’ve seen his best work on such compilations as From The Vault, Heartbreak & Triumph and Mr. WrestleMania, with a few hidden gems included amongst modern classics on My Journey. Instead of recycling these famous bouts, “Shawn Michaels: The Showstopper Unreleased” lives up to its moniker (well mostly, since one match actually has seen the light of day on DVD) by providing dozens of Shawn contests that are either long-forgotten, never-before-seen or lost in the sands of time. And given Michaels’ in-ring reputation, it’s not a surprise that even this round-up of matches – essentially a B/C-level collection, since it doesn’t feature major PPV bouts or even highly-memorable RAW outings – demonstrates just how good Shawn really was, and why he is one of the best ever. As with the Randy Savage Unreleased DVD earlier this year, the wealth of matches means that I’ll simply spotlight ten bouts in this review. It doesn’t mean that these are the best of the bunch; they’re just the matches that caught my eye for curiosity reasons, and they are all particularly appealing out of the many unseen battles included in this three-disc set. So, without further ado, let’s get to the action! TWO WORDS FOR YA! “Amazon.com” and “Amazon.co.uk” to buy the HBK DVD where you are! This occurs early in Shawn’s career, and is more of a showcase of his opponent than the subject of this DVD. Roberts had already been around for a fair few years by this point, so saying that this is a “young” Jake is a slight exaggeration. However, it does predate both men finding real fame in the WWF, where they unfortunately did not battle in singles action. Therefore, if you’ve ever wanted to see Shawn vs. Jake, this is the best that you will find. Shawn and Marty Jannetty really put themselves on the map in the AWA, which is why we get several Midnight Rockers bouts here from that promotion. Whilst there, they would collide with The Nasty Boys, but in this contest, Jerry Sags is replaced by Dennis Stamp, who you may know from his unexpectedly amusing cameo in Beyond The Mat many years later. I picked this out because it’s the sort of match you would never see on any other DVD, which is why these Unreleased sets are so unique. One of the best parts about this DVD is that, from their WWF tenure, we see The Rockers against virtually every great Federation team of the late 1980s/early 1990s. The last match on disc one sees Shawn and Marty face The Legion of Doom, and while it isn’t quite the dream match that some fans may have hoped for, it is another step towards what would be one of the most famous swerve-turns in wrestling history, where Shawn turned heel on Marty at The Barber Shop. By this point, Shawn is flying high as a singles act, and had been Intercontinental Champion for several months. 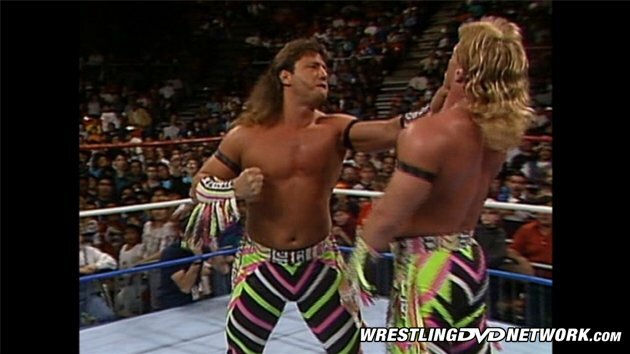 He had faced Tatanka the previous night at WrestleMania IX, and this dark match would be a test run for the subsequent feud between Michaels and Mr. Perfect. RAW had arrived earlier in the year, but it hadn’t reached the levels of importance that it would attain later on, meaning that the WWF taped Wrestling Challenge as opposed to RAW the night after ‘Mania IX. That in itself is fascinating to consider (RAW did air, but as a pre-taped show with references to WM thrown in here and there, which is also fascinating when looking back). If you picked up the WWE Unreleased 1986-1995 DVD, you’ll have seen a rare sighting of HBK and Bret Hart on the same team, and we get another snapshot of a Michaels/Hart combo with this contest. Given that Diesel was WWF Champion at the time, and that Bret was feuding with the likes of Isaac Yankem DDS and Jean Pierre LaFitte at this point, it is intriguing to consider what Shawn and Bret would have been like as an on-screen alliance, if only for a couple of PPVs. It could even have played into their eventual WrestleMania XII Iron Man match. Considering that the WWF of 1995 was a low point from a creative standpoint, this feels like a missed opportunity in hindsight. Remember when Bret Hart noted that he would have dropped the WWF Title to the Brooklyn Brawler if need be, prior to the Montreal Screwjob? Well, the odds of that actually happening were extremely low, but Brawler did earn a WWF Championship opportunity at Madison Square Garden against old HB-Shizzle. Of course, Shawn retains, but his future would soon be put in real jeopardy after he suffered a serious back injury which, after one more match against the red-hot Steve Austin at WrestleMania XIV, would sideline him for several years. A classic return at SummerSlam 2002 would be followed by a World Heavyweight Title win inside the Elimination Chamber for Shawn. 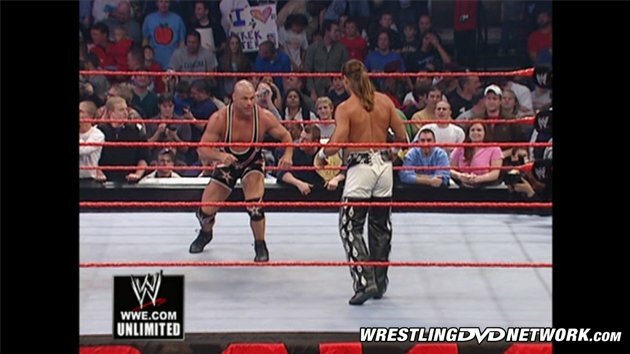 Eight days later, he faced RVD in this bout, his first TV clash since 1997. It’s watchable, but it feels like Michaels still wasn’t 100% sure what he had left in the tank as it pertained to a regular match (SummerSlam had been an Unsanctioned Fight, allowing for weapons and other gimmicks). If this same match took place even a year or two later, it probably would have been one of the best RAW matches of the year; occurring when it did, it’s good, but not great. When you think of Shawn Michaels and Ric Flair, you’ll think of WrestleMania XXIV, Bad Blood 2003, or possibly even their singles scrap just prior to Michaels breaking up The Rockers. Few remember this battle from RAW in Japan, and yet it’s a fun, old-school contest between two masters of their craft. Michaels picks up the victory, giving him a momentum boost just as he was heading into an unforgettable feud against Kurt Angle. Speaking of Kurt, he and Shawn traded wins throughout 2005, leading to their final match on this RAW from early 2006. It’s understandable as to why this is the more forgettable of their four singles battles, but it’s still a great contest, and the highlight of the whole DVD in my opinion. Shawn triumphs (this is a recurring theme), meaning that he lost their original (and biggest, not to mention their best) bout at WrestleMania 21 but would ultimately win the war. Hey, given recent events, do you think that we may get to see Shawn and Kurt lock horns one more time? The last match of this DVD sees Shawn and Undertaker team up against JBL and Kozlov (remember him? ), mere weeks before they would put on an all-time classic at WrestleMania 25. The key to the build of their first ‘Mania match was how Shawn was able to get into Undertaker’s head, and judging by what we have seen recently on RAW and at Super Show-Down, Michaels still has the ability in kayfabe to get under ‘Taker’s skin. It is intriguing to consider just what will happen when Shawn and ‘Taker stand opposite the ring in a sanctioned match on November 2, and just how much Michaels has left in the tank for his first match since March 28, 2010. As mentioned, it’s a fitting time to look back on Shawn’s legacy. We already know about his WrestleMania classics, DX and everything in between, but perhaps this scan of hidden battles from Michaels’ back catalog acts as stronger evidence than his famous PPV encounters to demonstrate that, regardless of the night, the opponent or the occasion, Michaels almost always rose to the occasion to put on an incredible performance. He is the perfect candidate for an Unreleased collection, and though we’re likely to get more in 2019 and beyond, few will be stronger in terms of in-ring action than this one. 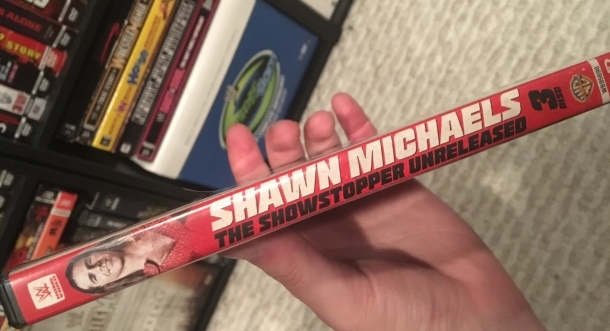 It’s obviously not the best HBK DVD that WWE has put on, but “Shawn Michaels: The Showstopper Unreleased” is definitely worth a look, and now is as good a time as ever with Shawn preparing to come out of retirement. – USA: RIGHT NOW!. Get the new HBK Unreleased DVD now here on Amazon.com. – UK/Europe: RIGHT NOW! Get the new HBK Unreleased DVD on Amazon.co.uk. Roddy Piper next for Unreleased? What was the one match already released? D-Generation X vs. Lance Cade & Trevor Murdoch vs. Charlie Haas & Viscera vs. The Highlanders from Oct 2, 2006 was released on the New and Improved DX and is also on this DVD. its been a week and still no walmart or target or best buy has the hbk dvd whats the deal??? My Walmart had it in stock. But I am in Flair country. We love our ‘rasslin. The Piper’s Pit segment was great too. Man I hope we get an unreleased Piper dvd in 2019!